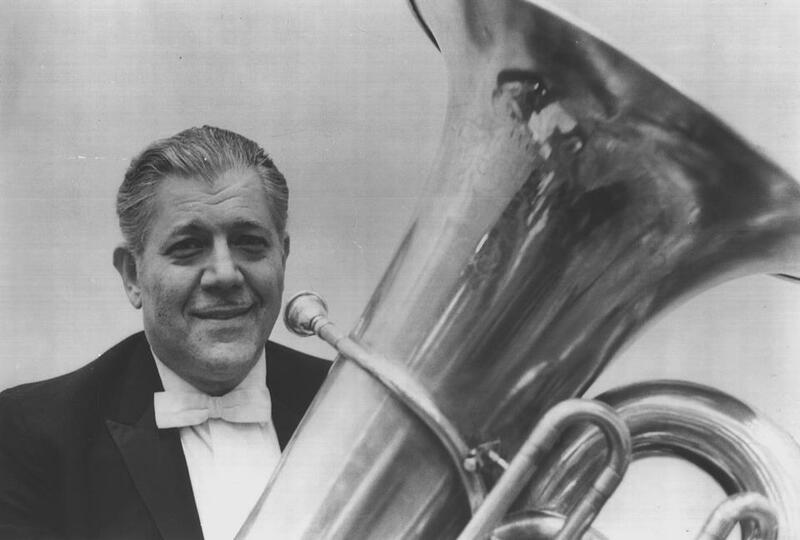 One of the great regrets of my musical education was that I was never able to arrange for a lesson with renowned Chicago Symphony Orchestra tubist Arnold Jacobs (1915-1998). I was not far into my undergraduate career when I first became aware of Jacobs and his work, and had resolved that before graduating from Delta State University I would make the trek up to Chicago in order to work, however briefly, with one of the twentieth century’s greatest brass pedagogues. Sadly, Jacobs passed away before I was able to realize that goal, so my knowledge of his teaching has come second- and third-hand, through books, recordings, master class notes circulating on the internet, and even anecdotes shared by his students. Even so, the available materials are a goldmine for brass players and teachers, and I am thankful for what opportunity remains for us to sit, as it were, at the feet of this great master, even after the passage of so many years. Someone with only a superficial understanding of Jacobs’s teaching or perhaps who is only beginning to study it might come away with the idea that his pedagogy centered upon breathing. This is understandable, given that Jacobs was a recognized expert on pulmonary function, having undertaken some study in this field at the University of Chicago medical school, and pioneered a number of diagnostic and practice tools designed to improve the use of the breath when playing wind instruments. Nevertheless, the more familiar I become with Jacobs’s pedagogy the more I realize that while he had a great understanding of the function of the body when playing and believed that one should both develop and utilize such understanding, particularly for diagnostic purposes, he believed that successful performance demanded not complex functions but simple ones. Successful musicianship comes not from trying to consciously micromanage the multiple muscular actions needed to play an instrument, but by allowing the subconscious “computer level” of the brain to handle those things (as it does in every other activity) and focusing the conscious mind on the desired musical results. Jacobs believed, taught, and demonstrated that the body will respond—and respond well—to exceedingly simple mental commands having to do not with individual muscle movements, but with the desired product. The result is an approach to playing that is relaxed, efficient, and joyful for both player and listener. One aspect of this teaching is the concept of “minimal motors,” which involves playing with the smallest amount of physical effort possible, and consequently the releasing of unneeded tensions in the body. In my own experience as a player and teacher I have observed that brass players carry tension in all sorts of places—the neck, shoulders, abdomen, and even glutes and legs can be affected. While varying amounts of muscular effort are necessary depending on the specific demands of different playing situations, any effort that does not somehow function to enable good playing detracts from it and therefore should be eliminated. To play with minimal effort is a lifelong quest for the brass player, but is a necessary one. Here are few reasons why. “Minimal motors” enables the fullest, best, most relaxed sound possible. Singers especially are aware of the body’s function as a resonator. One reason that Luciano Pavarotti (1935-2007) was able to produce such a big, gorgeous sound was that his barrel-chested frame helped to facilitate his production of such a sound. While the body’s acting in this way is less pronounced for instrumentalists, it is still helpful for us to be as open and relaxed as we can on a given pitch in order to produce the best possible sound. Relaxed muscles allow this to happen; tense muscles do not. “Minimal motors” aids in flexibility. Successful music making requires the ability to move well. Brass players can sometimes mistakenly think that as long as our embouchures are flexible we will be able to play our best, but if the rest of the body is excessively tense breathing is constricted and the ability to make subtle adjustments in horn angle or other aspects of holding the instrument is reduced. The latter movements are more important for moving throughout the tonal range than some players realize or admit…until excessive tension restricts such movements. “Minimal motors” reduces the negative effects of performance anxiety. I have long since given up on totally eliminating performance anxiety from my experience as a musician. I tend to get nervous in high-stakes playing situations, and if anything this has worsened as my expectations of myself have increased and as I have dealt with the effects of injury. Instead of trying to “not be nervous,” I have experienced much greater success in managing or eliminating the effects of nervousness, of which excessive tension is one. If you are given to playing with unnecessary muscular effort in the practice room, the effect of “nerves” on stage will be to further intensify this, perhaps even making playing impossible. If, on the other hand, you cultivate a “minimal motors” approach in the practice room, there is little or no excessive tension for the nervousness to exacerbate on stage, and the physical effects of anxiety are significantly lessened. This sometimes causes the mental and emotional anxiety to eventually dissipate, as well! “Minimal motors” helps one to cope with the effects of aging or injury. I have discussed the effects of my own spinal issues (both congenital and resulting from injury) from time to time on this blog, so I will not rehearse them again here except to say that if anything these have caused me to prematurely experience something like the effects of aging. I now lack the physical strength and stamina that I had in my late teens and twenties, so I can no longer “muscle through” pieces of music despite multiple physical inefficiencies in my approach to playing. Instead, I have had to identify and eliminate these inefficiencies, a process which is ongoing and probably will continue for the rest of my career. Because of the use of “minimal motors,” I am in some respects playing better now than I ever have despite my physical challenges. Now I only wonder how “23-year-old me” would have been able to play with similar efficiencies. “Minimal motors” makes playing more joyful. When the body is tense and the mind is likewise occupied with excessive effort thinking about how to play instead of thinking about results and allowing the body to do its thing, playing music is no longer fun. It is drudgery instead. Making great music is an extraordinarily difficult undertaking whether one is doing so vocationally or avocationally, and brass instruments are among the most challenging instruments to master. If we cannot experience joy when playing we probably won’t bring joy to anyone else either, so why go to all of this effort? Why not do something else that is both easier and more lucrative to boot? Happily, the use of “minimal motors” is a great help to eliminating the tensions, the pains, the anxieties, and everything else that robs us of the joy of making music and sharing it with others. In that vein, I’ll conclude with an excerpt from a master class Arnold Jacobs gave for the United States Marine Band in 1991. I first heard a recording of this passage more than fifteen years ago, and I still think of it regularly. There are things going on that your brain cannot comprehend, and what we must understand is that we are an enormously complex piece of machinery, but made very simple for use by what I would call it, biocomputer level of the brain. Regions above the brain stem where the coordinate functions of widely diverse fiber groups that coordinate what ones to fire, what ones keep you straight what ones should not fire, and it takes all of these things at a computer level rather than at the intelligence level of the person. You don’t even know that they exist and that makes you free to do what you want with your body cause you don’t have to worry about it. Only in music do I find people worrying about using their bodies right. Go to the products, get the results. Don’t worry about the body just make sure it sounds better than anybody else, that is the big factor. Take enough air so you can waste it…as I say it’s free it don’t cost nothing. Recognize that the intelligence of the human being has to do with the phenomenon of life outside our body, it doesn’t have to do with the phenomenon of life inside your body. Inside the body there is a system of controls internally that takes charge of it constantly, homeostasis, the ability to maintain temperature, acid alkaline levels, all of these things are taken care of in a level of the brain so that the intelligence is free to cope with all the phenomenon of life of the things you want to think of or do, where you want your body to go. You don’t have to worry about the variety of hundreds of muscles, you don’t have to try and control each one, it is done elsewhere in the brain. If you transfer this to music, it becomes a joy, it becomes so simple in playing. There it is. I claim no expertise with regard to Jacobs’s pedagogy and certainly don’t claim that all of my thoughts and applications regarding the “minimal motors” concept are entirely in keeping with his teaching. What I do know is that excessive and unproductive effort when playing a brass instrument leads to frustration, lack of joy, and generally poor results. Relax the body and focus on making music. It works, and the results are satisfying for both player and audience. This entry was posted in Arnold Jacobs, Pedagogy, Performance Anxiety, Performing, Teaching Low Brass. Bookmark the permalink.